Blue Jean Networks’ skilled IT technicians can help your business move away from Windows Server 2003 in the most efficient manner possible. Allowing us to make these adjustments to your infrastructure for you allows your business to avoid struggles that are normally related to upgrading a server. Hardware failure can lead to data loss, which often causes extensive downtime that your business can’t afford. The IT professionals at Blue Jean Networks can help your business integrate modern solutions that are less likely to falter, allowing your company’s server to function without a hitch. Since upgrading from Windows Server 2003 will likely include migrating your data to a more modern server, some of these legacy applications might not be compatible with a new server unit. Blue Jean Networks can help your business identify these discrepancies and discover the best solutions for these complications. Naturally, this is a cause for concern. While Microsoft does allow for custom support past the expiration date, the cost is far too steep for the average SMB. The benefits of upgrading make extending your use of Windows Server 2003 obsolete, so it’s recommended that you let Blue Jean Networks help your business move toward a more recent server OS in favor of greater reliability and security. 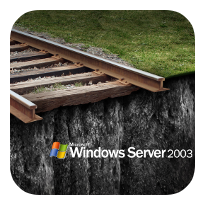 You don’t want to wait until the last minute to upgrade away from Windows Server 2003. It’s an involved process that demands both time and a certain aptitude for technology. Blue Jean Networks can help wean your business off of Windows Server 2003 and integrate new, modern solutions designed to improve efficiency. Give us a call at 817-231-0222 to learn more.